via Enrique 262 Tumblr Page! 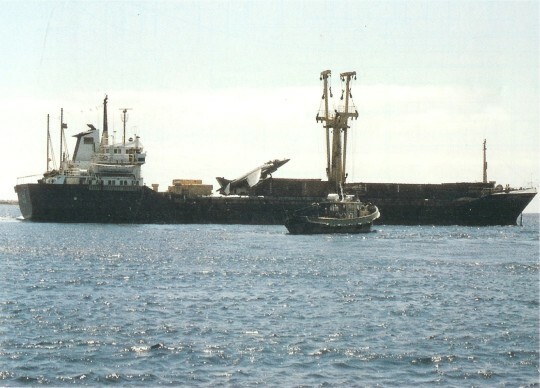 The Alraigo Incident refers to the landing by a lost British Royal Navy Sea Harrier fighter aircraft on the deck of a Spanish container ship in 1983. On 6 May 1983 Sub Lieutenant Ian “Soapy” Watson was a junior Royal Navy Pilot undertaking his first NATO exercise from HMS Illustrious, which was operating off the coast of Portugal. Watson was launched in a pair of aircraft tasked with locating a French aircraft carrier under combat conditions including radio-silence and radar switched off. After completing the search Watson flew to an arranged meeting point with his flight leader. When the flight leader did not appear Watson turned towards Invincible expecting it to appear on the radar; when he was unable to find the carrier he made a radio transmission. It was at this stage he realized his radio was not working and the NAVHARS (inertial navigation system) had not taken him back to the expected location for landing. As Sea Harrier ZA176 began to run low on fuel Watson turned the aircraft East towards a known shipping lane making radar contact with a surface vessel at 50 mi (80 km). At 12 mi (19 km) he made visual contact with the container ship Alraigo and initially planned to eject in sight of the vessel. After performing an initial fly-by of the Alraigo Watson noticed that the ship was carrying a number of flat topped containers similar in size to a practice landing pad. The container was carrying a base plate for a telescope being delivered to the La Palma Observatory in the Canary Islands. 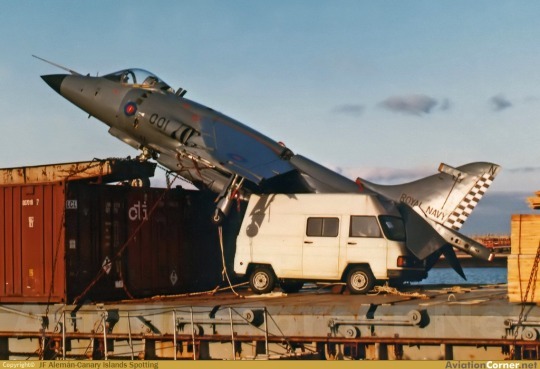 On his second approach Watson landed the Sea Harrier on top of the shipping container with only a few minutes of flight time to spare. As he touched down the aircraft began to slide backwards on the wet surface. Watson attempted to retract the landing gear to arrest the slide but this failed and the aircraft slipped backwards off the container and onto the roof of a van parked on the deck. The van partially held up the fuselage and stopped a further slide. Four days later a considerable international media presence witnessed the Alraigo sail into dock at Santa Cruz de Tenerife with the Sea Harrier still perched on its container. The aircraft was salvageable, and the ship’s crew and owners were awarded £570,000 compensation. 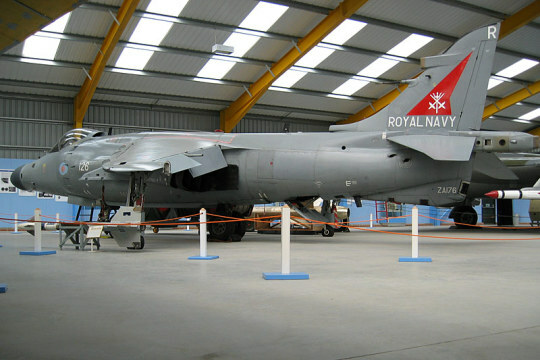 Sea Harrier ZA176 was converted to the FA2 variant in 1992 and retired from service 20 September 2003. The aircraft is now on display at Newark Air Museum in Nottinghamshire England in its FA2 configuration. Simply awesome story. Wonderful airmanship. Nicely done.